Our research continues to support a Bullish price bias over the next 30+ days, very likely reaching to new all-time highs again, before June/July 2019. For many months, other researchers have continued to predict “doom and gloom” with warnings of Treasury yield inversions, global collapse events, and other crisis events. Yes, we believe continued price rotation will drive future price swings and they could be volatile moves – yet we believe any crisis event will actually become an incredible opportunity for long traders to BUY into the markets at extreme lows. Recently, our researchers focused on OIL and the Transportation Index as key elements suggesting this upside move is far from over. Oil has moved from below $55 ppb to well above $60 ppb. 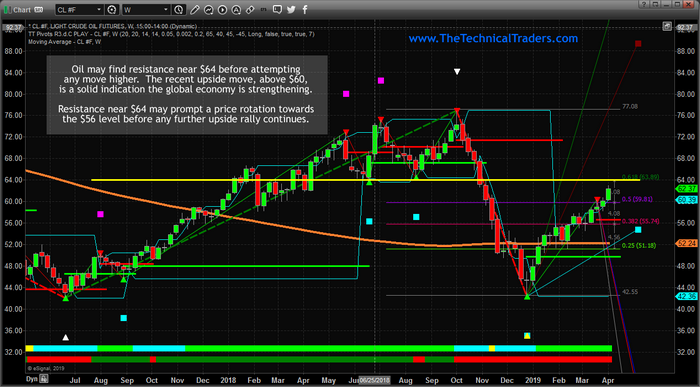 We believe this move will continue higher to target the $64 ppb level were resistance is likely to be found. We do believe that some price rotation in Oil is likely to happen in the Summer months – when travel increases and Summer blend gas hits the markets. Winter has been uniquely difficult this year and the rise in Oil prices, where OPEC and foreign market events have attempted to push prices above $50 ppb, is warranted given global economic activities. While Oil continues to climb, the Transportation Index is also rallying above recent resistance near $10,500 and pushing higher targeting the $11,250 level. This is important because the Transportation Index typically leads the US economy by about 3~6 months and is a key indicator of investors future expectations for the US and global economy. Any push above $11,000 in the Transportation Index would likely mean we are going to attempt to reach all-time highs near $11,634. A move like this would likely push the US Stock Market Indexes well above recent all-time highs as well. Much of our recent analysis has been an attempt to relate the opportunity that exists over the next 30~60 days in the US Stock Market. For well over 12 months, we've been suggesting a capital shift is taking place where the US stock market, and the US Dollar, are uniquely positioned to become safe-haven investments for foreign investors. We believe this process is still taking place and we believe the US market could continue to push up to new all-time highs before another rotational move sets up. Our most recent research suggests a peak may form near June/July 2019 that should concern traders. Until then, we believe the upside price bias will continue and we still believe new all-time highs are about to be reached. As of today, we have technical confirmation that a renewed upside price move is taking place and we continue to watch the precious metals for any signs of a base/momentum bottom. Follow our research and learn how we can help you find and execute better trades. Take a minute to find out why Technical Traders Ltd. is quickly becoming one of the best research and trading services you can find anywhere. We are about to launch a new technology product to assist our members and we continue to deliver incredible research posts, like this one, where we can highlight our proprietary price modeling systems and adaptive learning solutions. If you want to stay ahead of these markets moves and find greater success in 2019 and beyond, then please take a minute to see how we can help you. 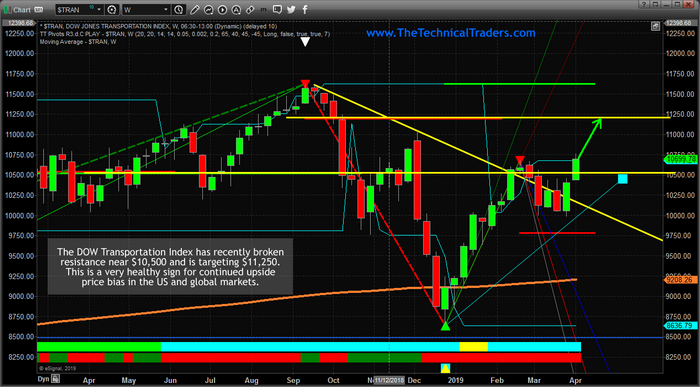 Once this June/July peak begins, you won't want to miss the next big move... Join www.TheTechnicalTraders.com today.